Find out your brain's potential, determine your intellectual quotient - wouldn't you want to test yourself? 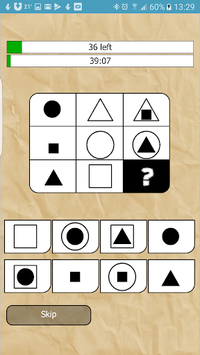 This IQ (intelligence quotient) test will help you decide if you need to raise your erudition or if you're intelligent enough to answer any question! This is the time to think about your IQ level. 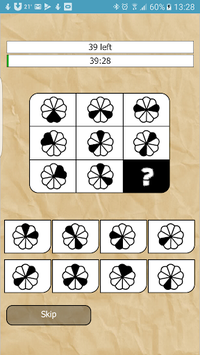 Try our IQ test and find out your intelligence quotient right away! The average IQ is 100. If you score higher that that, you're a genius; if you score lower, you would need to spend more time reading smart books and take our IQ test again later. - the test consists of questions of varying complexity, the purpose of the test is to determine the level of intelligence of the subject. - how the app works: the app offers you the chance to answer questions. If you're having a hard time answering, press "Skip". 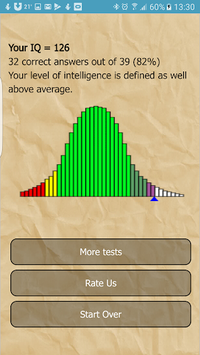 After you reply to all the questions, the app will determine your IQ level and show it, supplemented with comments.